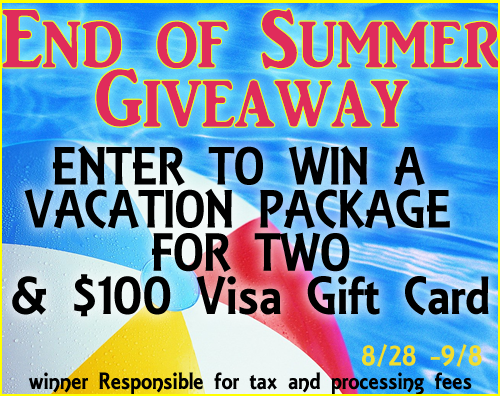 What better way to celebrate the end of summer than with a fun vacation giveaway! 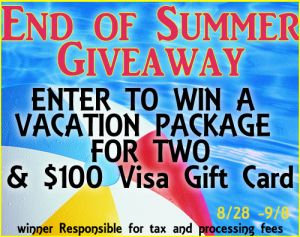 You can win a fun trip getaway for two in this giveaway! Sarah with Route 69 Romance Parties and some amazing bloggers like So Cal Coupon Mommy, Frugal 4 Four, Dixieland Product Reviews, Capri Coupons and MANY more want you to have an AWESOME End of Summer Giveaway. ONE Lucky winner will receive: Voucher good for a 2 night vacation package with airfare & hotel accommodation paid for two, with destination choices of Los Angeles, Las Vegas, Orlando Fl, Puerto Vallarta or New Orleans. 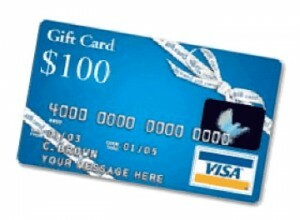 Recipient is responsible for the $65 processing fee + all applicable taxes. Sarah with Route 69 Romance Parties offers fun and exciting products which range from Spa Products, Massage Products, and adult novelties. You can order online, book a catalog/online party or even have a home party (within travel distance of her) For more information on the product she carries or booking a party please feel free to contact her at SarahOnRoute69@yahoo.com. Giveaway Bandit is not responsible for prize distribution. I’d probably choose New Orleans since I’ve never visited the city. I would pick Las Vegas because I have never been there and my husbands family lives there and he ha not seen them in about six years. Mom to bed by 8 didn’t work when tried to subscribe by email. so I subscribed directly on their site. New Orleans. I have been there once and loved it, would love to go back. I WOULD LOVE TO GO TO ANY OF THESE PLACES. BUT LAS VEGAS WOULD BE MY PICK. Orlando because my daughter is wanting to see the Harry Potter deal at Universal real bad! vegas because I have always wanted to go. It would be either Vegas or Puerto Vallarta. I would pick Las Vegas or Orlando because I would like to hit the strip or Disney! London! That would be amazing! I meant Las Vegas lol oopsie! Vegas!! I once told my fiance (of nearly 10 yrs) if we ever stepped foot in Vegas, we’d get married there…haven’t been yet! AWESOME. I would love to go to New Orleans, I have never been anywhere too far away from Michigan..it would be nice to go somewhere different. Thanks so much for hosting this great giveaway! Las Vegas. I have a dear friend there that I haven’t seen in years. Would love to see her. Puerto Vallarta…never been, heard good things, haven’t been to a beach in much too long! Thanks for doing this contest! Vegas, I would love to see all the lights on the strip and the desert and just a bunch of other things. I would pick New Orleans. We’ve never been and I’ve heard the eating is good. Thanks for a great giveaway! I’d choose Las Vegas because it’s a fun destination with tons to see and do–plus it would make my boyfriend’s day if we were to go there, he’s been planning for us to go there for ages! That’s a hard choice! I’m torn between Puerto Vallarta or New Orleans. I’m thinking Puerto Vallarta though because it sounds intriguing. Heck, I’d be happy to go to a hotel anywhere overnight just to get away! It says to sign up for the 6 newsletters but I only see 4. Am I missing something? Thanks! I live in L.A. so I would love to go to Puerta Vallart and excape!! Same here on the newsletter / email sign ups….I only saw for and not 6 ? It’s hard to chose – Florida is beautiful…my son lives in the southern part of Florida but I have never been to Las Vegas or New Orleans. I would probably chose New Orleans…I’ve heard the food is amazing! I’d probably choose Las Vegas because I’ve never been there and it’s about time I go. Depending on my husband’s preference, it would be either Vegas or New Orleans. Oops. Forgot to put why. Because I loved New Orleans and have wanted to go back for years now although Vegas would be because I’ve always wanted to go. las vegas! i’ve actually never been there. New Orleans, because it’s the only one on the list I haven’t been to yet! Thanks for the opportunity! I would go to vegas! It would be so awesome! Probably Vegas. I’ve been there once and know there’s a lot to do. Puerto Vallarta, just because I’m risk taker! Las Vegas because my husband has never been there and is always talks about going. Probably Las Vegas, we love that place! Orlando – it’s family oriented and the easiest for us to get to. New Orleans. I haven’t been there, and I have a couple “internet” friends that I have known for over 10 years that live down there that I could visit! I would pick Los Angeles because my grandsons live a couple hours away and I haven’t seen them in over two years. I would love to go to Vegas! I have never been and it would be a nice state to check off of my bucket list! Thanks for the chance! I’d love to go to New Orleans! I’ve always wanted to! I would pick Las Vegas, my favorite place! It would be Las Vegas. I love it there. I love the selection of entertainment and the timelessness. Time is suspended. And did I say I love Glitz. Probably LV. My husband and I never had a honeymoon when we married in 2008 so this would be a great honeymoon!!! Puerto Vallarta because I’ve never been there. Puerto Vallarta because I love mexico! Vegas, I have been wanting to go for so long now. would love for the chance to go. New Orleans…I’ve always wanted to go. I dunno which one I’d choose – all depends on who goes with me. If it’s someone who’s done a lot of travel abroad, I’d pick Puerto Vallarta… if it’s my BFF, I’d pick Los Angeles because her brother lives there and could give us ideas of where to go… if it’s just me and my kid, we’d go to Orlando. I would pick Las Vegas, because I have never been and I like the sound of buffet! Perhaps New Orleans, because I live near LA, been to Las Vegas and dislike it haha, and I want to experience something “off the cuff”. I would pick Las Vegas because I have never been there! i would select new orleans because its a place i’ve always wanted to go. I would choose New Orleans. I’ve never been and I’m dying to go! Hmm..probably Las Vegas! My hubby has never been and I went when I was 16. New Orleans because my sister and her family live close to there and I haven’t seen them in a couple of years. I would probably chose New Orleans. Sounds like a blast!!! I would choose Puerto Vallarta OR New Orleans. Puerto Vallarta b/c I have always wanted to go to Mexico & it looks so gorgeous. I would love to swim in the waters & bask in the sun! New Orleans b/c my hubby has been there several times, both before the Hurricane and since, but I have never had the opportunity to go. I would really like to check out the abandoned Six Flags outside of New Orleans. If you look up photos of it online, you will see how amazing it looks & as an amateur/student photographer, I would love to created a set of work from this site! Thanks so much for the opportunity. This would be SO AMAZING!!! Orlando. My husband has always wanted to take me back there (he use to live there). I have been wanting to visit New Orleans for many years. This is actually where we plan on going if we can take a vacation by ourselves. The #1 reason we haven’t had a chance to go is funding. So winning this trip would be fabulous, and much needed!! I would go to New Orleans because I have never been and I have always wanted to go.